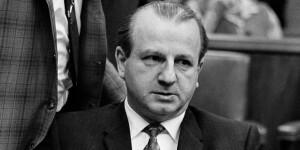 Born Jacob Rubenstein in Chicago, he changed his name to Jack Ruby in 1947. A small-time mobster, Ruby owned or managed Dallas nightclubs and strip clubs. On November 24, 1963, two days after Lee Harvey Oswald was arrested for the assassination of President John F. Kennedy, Ruby shot Oswald at point-blank range as he was being transferred from police headquarters to a jail. The shooting was televised. Ruby was convicted of murder on March 14, 1964, and sentenced to death, but was subsequently granted a new trial. He died of a pulmonary embolism before the new proceedings began. Ruby’s motive has never been determined. Some believe he was hired to silence Oswald as part of a conspiracy to assassinate President John F. Kennedy, but all evidence indicates he simply sought vengeance on the killer of the president he greatly admired.